The classic, 10-ball Roman candle featuring alternating shots of red and green stars. Each of these Roman candles from The Great American Fireworks Co. fire 10 golden, crackling shots. 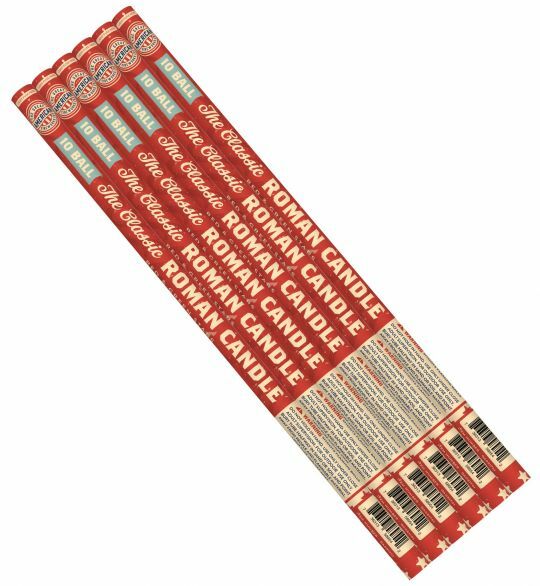 This Roman candle assortment contains 2 each of 6 different 10-shot Roman candles: Red and Green Stars, Red and Green Star with Report, Crackling Candle, Blue Star Candle, Red and Green Crackling Candle, and Silver Tail Candle. This pack of candles is one of the best values in our Roman Candle category. Each candle is smaller than a standard Roman Candle, but still has 10 shots of vibrant, assorted colors!